Los Tweens & Teens founder, Cristy, and her teen daughters, The Sophlivia Twins, went LIVE on Facebook LIVE to show us the beautiful mountains of North Carolina, which they drive to from Miami a few times a year. Cristy shares safety tips to make sure your roadtrip is a smooth one – for example, taking into consideration the different driving conditions in each state and carrying a print-out map in case there’s no cel service – and shares what you can do before going into the road to avoid minor – or big- accidents like they experienced this time. No worries – they didn’t suffer any harm, just a little scare! 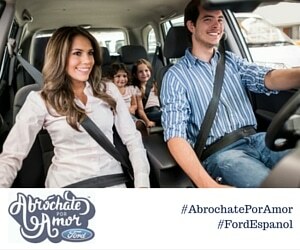 New car technologies offer road and terraine assistance and we happy to be a partner of Ford’s #AbrochatePorAmor campaign. This entry was posted in Mentors4Teens, Summer, Travel, Videos and tagged family travel, North Carolina, Sophlivia Tweens, summer roadtrips. Bookmark the permalink. Love this video, thank you for sharing! Having driven to both GA and TN and back, it is no joke when you are unfamiliar with the roads outside of Miami!